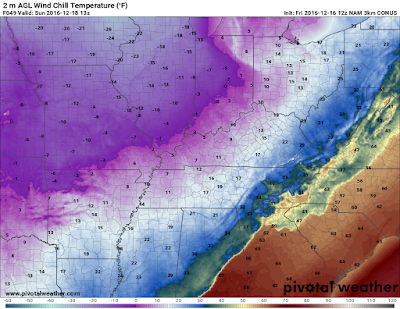 As we predicted in our Friday evening blog, this was indeed a wild and wacky weekend in Mid-South weather. An Arctic cold front, bringing a surge of the coldest air felt yet this winter, sparked widespread thunderstorms along and just behind the front. Wind, both ahead of and behind the front, was a significant issue and the thunderstorms caused scattered wind damage of their own as well. Following the storms, temperatures were quick to fall. 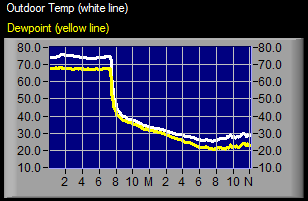 At MWN on the north side of Bartlett, the mercury fell from 75° at 7:20pm to 53° in twenty minutes, 44° in less than an hour, and into the 30s in less than two hours. 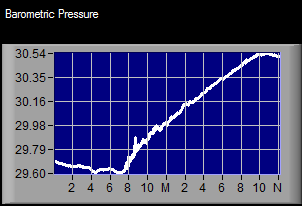 The graphs below show the precipitous drop in temperature and subsequent rise in pressure behind the front. Fortunately, precipitation tapered fairly quickly once the frozen stuff began to mix into the rain and only light amounts of sleet occurred. By Sunday morning, roads were mainly dry, or at least just a bit damp, with temperatures in the mid 20s and a biting north wind. Moving on to the aftermath, the greatest damage I have seen via social media and news reports is a series of power poles snapped and an apparent fire at the Gateway Tire store on McIngvale Road in Hernando, across the street from Hernando High School on the east side of I-55, and some minor roof damage in an adjoining neighborhood. Re-creating the timeline of events, the first report of something suspicious in the area was actually an aircraft on final approach to Memphis International about 10 miles south of the airport at 8:45pm. The flight crew reported seeing a "possible tornado." There are some discrepancies with the report in that the pilot report (PIREP) location was provided as 10 miles south of MEM, but the actual text of the report stated "2 mile short final [approach to MEM]." Either way, something fishy was occurring in storms south of the airport. Within a couple of minutes of the report reaching the National Weather Service, a Severe Thunderstorm Warning was issued for the storm, at 8:54pm. Then a couple minutes later, public reports of power lines down (as described above) were received. Subsequent storms, beginning about a quarter past 9:00, prompted Tornado Warnings for eastern DeSoto County and points south and east (Marshall and Tate Counties in particular). However, a Tornado Warning was never issued for the storm that produced damage in Hernando. I have received several reports of "sirens not sounding" and an eyewitness in the news report above seemed to indicate that the storm hit without warning. I have a handful of comments. I'll try not to lose followers with these comments, but be forewarned, this part is commentary. I'll be blunt. If sirens are your primary means of taking action in the face of a possible tornado, and you're inside, you're doing it wrong. Sirens are for outdoor use. With pounding rain, thunder, and strong wind, their range is limited and sound muffled. DO NOT RELY SOLELY ON SIRENS FOR YOUR WARNING SYSTEM. They serve a purpose. It isn't for indoor warning, even if one is not far from where you are. They are to let those outside know that they are in a dangerous situation and to go take shelter or, at the least, gather more information on the threat. I had stated yesterday in social media posts that the tornado threat would be primarily limited to brief tornadoes that would likely occur in the line of storms. These types of non-supercell tornadoes are quick to touch down and lift and exceptionally hard to warn for given current technology. The NWS does a fantastic job, but if they were to warn for every thunderstorm that rotates, the false alarm rate would be close to 100% (because the vast majority of rotating storms don't produce tornadoes with damage) and more people (than already do) would not pay any attention to them. I'm assuming there was no Tornado Warning for the storm in question because the tornado (assuming one occurred, which isn't confirmed at this point) was brief and had lifted before the warning forecaster had even seen it on radar. Again, I haven't spoken to the NWS, but I have good friends who work there and I've observed warning operations in person before. The storm was at the least producing strong wind and a Severe Thunderstorm Warning was issued for those in the path of the storm moments later. Blunt, again... I'm getting tired of hearing people say that the storm "hit without warning," or in this case, "I don't think anybody expected it at all." Now, MAYBE the person who said this in the article above meant that she (and "anybody" else, whoever that is) didn't expect it could actually happen to her. But all of the local (and even national) weather folks had been talking about the real potential for severe weather in our area at least since Friday (and it was mentioned by us a couple days before that). There was a Tornado Watch issued mid-afternoon, many hours before the storms arrived. For gosh sakes, it's December and the temperature is 75° with very humid air and a strong wind! If you somehow didn't know you were in a watch box, the conditions should've been enough to tell you that maybe you should be paying closer attention to a weather source! That particular storm doing damage in that section of Hernando might've not been predicted, but the fact that it COULD happen means it was not completely unexpected. It's 2016. You all have multiple options for staying abreast of rapidly changing weather conditions. I can tweet until my fingers fall off and the TV weatherman can talk until he runs out of breath, but if the public doesn't take some amount of personal responsibility for becoming a knowledgeable consumer, then our efforts are for naught. 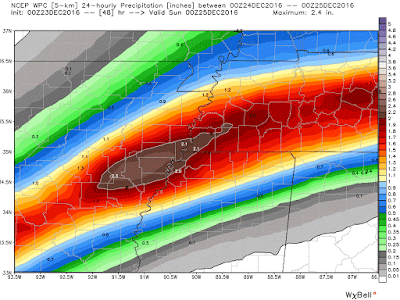 There's a massive push underway to put more "social science" in meteorology. Not only producing accurate forecasts and warnings, but creating and disseminating the products in a way that will result in the most eyes and ears taking notice, comprehending, and taking action against. I'm all for this. But I also know that there are some folks out there that you can tell a tornado is going to hit their house in 5 minutes with 100% certainty and they still won't respond. Lack of personal responsibility will always result in some people saying they "didn't know" that xyz was going to happen. It hit without warning! If you're reading this blog, I assume you're not one of those people. I'm all for better products and services that can reach the most folks and end in response and preparation, but I also believe that we (the scientists) can't sacrifice improving the science and accuracy of our products in the name of trying to figure out a way to personally hit some people over the head to try and get them to respond. The response is up to the individual, based on their individual risk and tolerance level, assuming they get the information. Personal responsibility says don't rely solely on sirens (or any single source, they'll all fail you at some point). Personal responsibility says you must take action if the information you have gathered results in a threat that exceeds your risk/tolerance level. 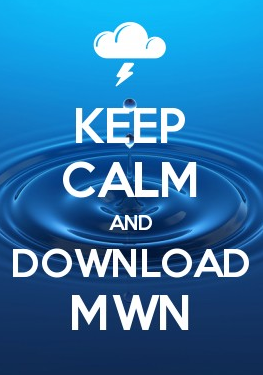 Be safe, be prepared, and be responsible. If you've ever ridden a roller coaster you know that there is typically a long steady climb then, just after peaking, a plummet that results in your stomach relocating to somewhere around your neck. Well hang on to your hats grandma, because our weather pattern (at least the temperature) is about to do the same thing! I'll break it down day by day. A surge of warm, Gulf-moisture laden air is moving north into the Mid-South on southerly wind which will really pick up tonight as the low level jet cranks up. The temperature has risen from the upper 20s this morning to the upper 40s this afternoon, even with cloud cover as wind has shifted south and that warm air moves north. Typically temperatures fall at night, but not tonight! With southerly wind increasing to 20-30 mph, the mercury will continue to rise overnight (just like the big hill on the roller coaster) as scattered showers also break out. If you're headed out this evening take the umbrella as you could get caught by a couple. 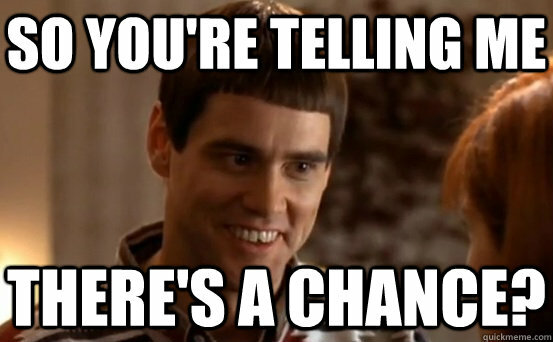 When you wake up in the morning, temperatures will likely already be near 60°. 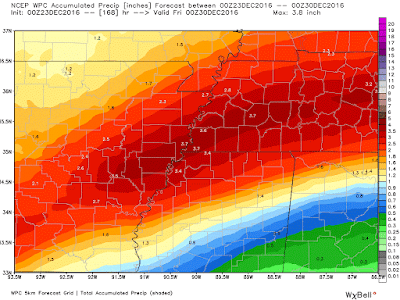 Rainfall tonight will likely be a tenth to no more than quarter of an inch. Strong southerlies continue Saturday with gusts to near 30 mph continuing. We'll still see scattered showers, but there are some signs that there could be a lull from mid-morning through the early afternoon. If you have last minute Christmas shopping, an umbrella is a good idea, but you may not need it much until mid to late afternoon. By then, an Arctic cold front will be drawing closer and more showers are expected to pop up. However, ahead of the front, temperatures may approach the record high of 76° by late afternoon! The roller coaster continues to climb... 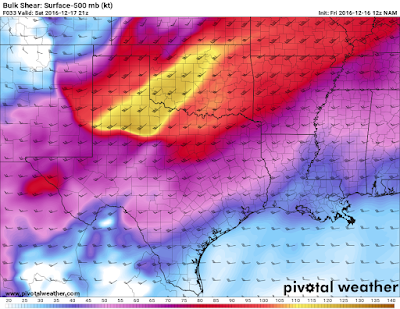 In fact, with abnormally strong wind at all levels of the atmosphere and that very warm air in place, instability and wind energy will combine to create a setup suitable for scattered thunderstorms by late afternoon. 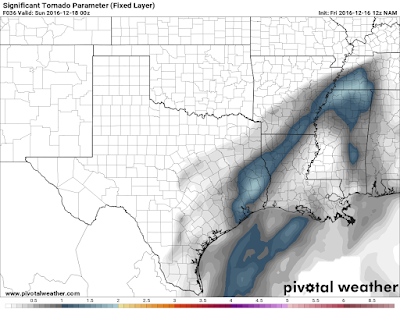 Most storms should remain below severe limits during this time. 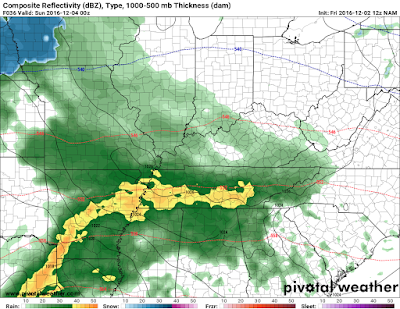 As storms will be basically building in the vicinity of the Mississippi River as they encounter air conducive to their formation, they will be gaining strength and likely coalescing into a squall line just to our east. We recommend any Saturday evening plans be indoors and that everyone should keep one eye on the weather situation, just in case warnings are issued. 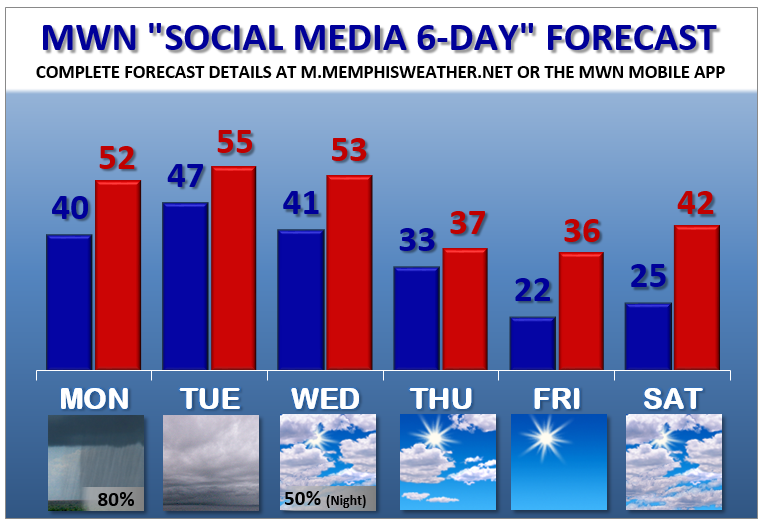 (We recommend setting StormWatch+ in your MemphisWeather.net app, then going about your business. It'll let you know if you are in harm's way, plus you can check our Twitter feed for updates!) The chance of severe weather is low, but something to certainly keep in mind. So you know what the roller coaster does when it reaches the top right? Yeah, it comes back down! Once the front moves through in the evening hours, temperatures plummet. Quickly. It is highly likely we'll be in the mid 30s by midnight. That's a roughly 40° drop in six hours or less! I have a headache just thinking about it... So what happens after midnight? MOST precipitation is gone by then, but some lingering moisture is expected and since temperatures are dropping so fast, there's a chance-worth-mentioning that we could see a bit of a wintry mix in the wee hours of Sunday morning. Precipitation totals are expected to be relatively minor (less than 0.10") with the most likely precip type being either sleet or freezing rain. It depends on how fast the cold air in the lower few thousand feet arrives. Anything we get should be gone by sunrise (none falling and probably nothing on the ground) but temperatures will be in the upper 20s with wind chills in the teens as you wake up Sunday. The other concern, with rain in the evening and plummeting temperatures is freezing on the roads. I don't think that will be a major concern. The 70s on Saturday will help some in that regard, but the strong wind will help even more. Even a cold blow drier is effective at drying your hair. With north wind gusting to 30 mph Saturday night, the roads should dry after midnight with little concern for travel. Because of the rain prior to freezing though, roads will NOT be treated in advance, so keep that in mind if you have to be up very early Sunday on the flyovers or elevated roadways. C.O.L.D. Clouds will be slow to clear but even with some afternoon sun, the strong cold air advection (movement of cold air into the area) will keep temperatures from rising. 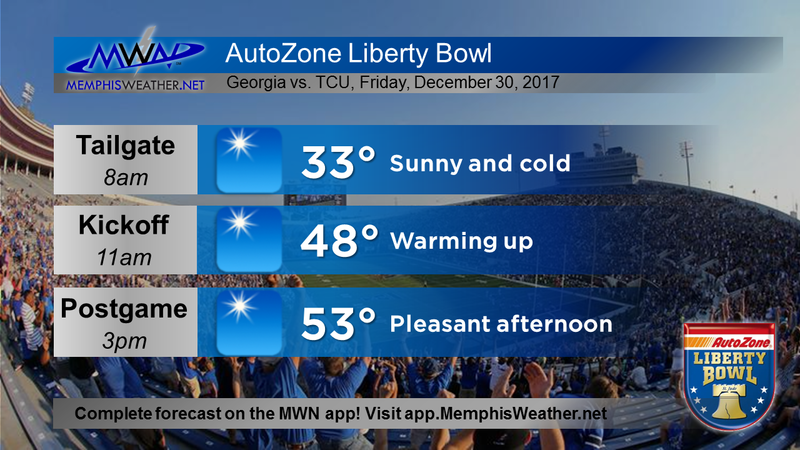 After a low in the upper 20s, we probably won't get to freezing for the high. Couple that with a relatively stiff breeze and wind chills will remain in the teens. BRRRR!!! Dress in layers if you have to be out, even though you had your shorts and flip flops on Saturday basking in the mid 70s! The coldest night of the year is expected Sunday night with temperatures well down into the teens and wind chills in the single digits. At least the kids don't have to be at the bus stop! Monday will see a good deal of sunshine but temperatures don't recover much, if any, above freezing. Beyond Monday, a temperature recovery takes place as highs climb back into the 40s and 50s and lows moderate back into the 30s. There will still be a couple of cold mornings early in the week though. Very little, if any, precipitation is forecast for the week before Christmas and an early look at Christmas Day indicates mild temperatures. 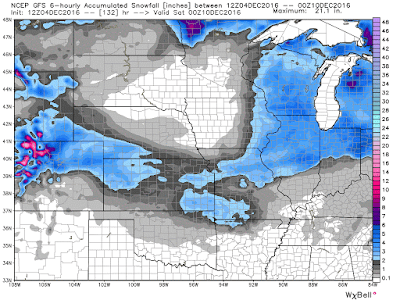 Things don't look good for a white Christmas this year! 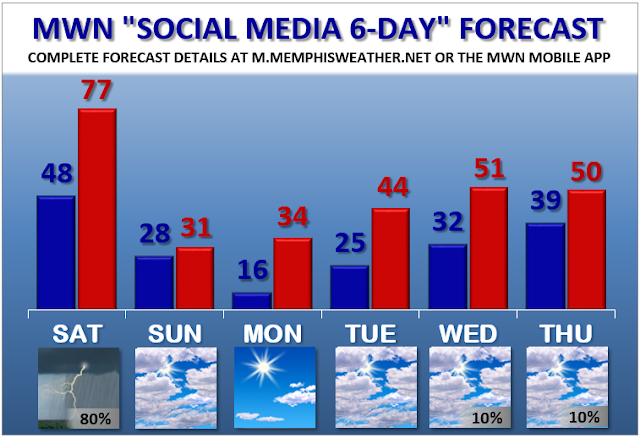 Get the complete 7-day forecast from us in our mobile app or website linked below. After getting through a couple of days that served as the coldest of the season so far (those morning lows near 20 were bitter weren't they? ), things have warmed back up a bit just in time for precipitation to arrive. A few spotty showers were around this afternoon and the weather won’t be improving overnight. Expect rain to increase in coverage as we head into the night. 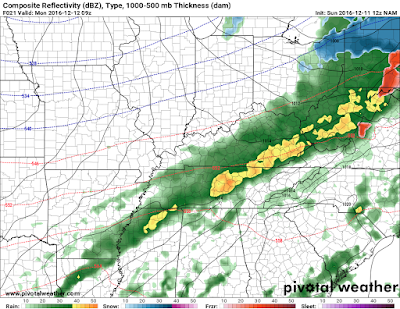 Occasional downpours and a chance of thunder (but no severe weather) are possible as a cold front moves through the Memphis metro area overnight. Temperatures remain nearly steady in the 50s much of the night until the front moves through in the wee hours Monday morning, then only dipping slightly into the mid 40s. Rain should cease by about rush hour Monday, but the sky will remain overcast through the morning with partial clearing in the afternoon as highs reach the mid 50s. The wind will calm to a light breeze (less than 10 mph) by morning as it switches directions from the south to the north behind the cold front. 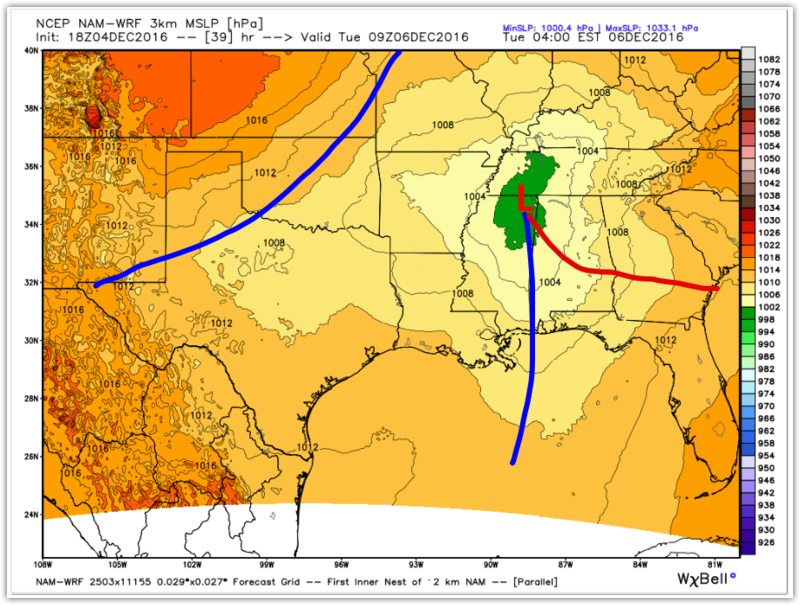 With the front hanging around between here and the Gulf Coast, a weak upper level wave along the front could bring a few very light showers back into the north MS portions of the metro overnight Monday night. For the mid-week period, high pressure to our north takes control, bringing cooling temperatures as the week goes on as another Arctic blast strafes the Mid-South, with the brunt of the cold air hitting the northern tier of the U.S. We'll be hearing about significant snowfall across the Midwest into the Northeast this week, but partly cloudy to partly sunny skies are expected locally. 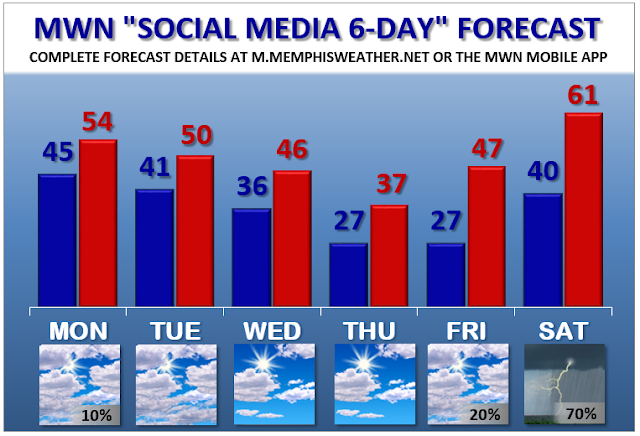 Highs slip from near 50 Tuesday to the mid 30s by Thursday though as the Arctic air seeps south. Lows will again be in the 20s Thursday and Friday mornings with dry conditions expected. Finally, as a side note, the Geminids meteor shower peaks this week on Tuesday night, but if there is any clearing at nighttime this week, you might take advantage of trying to spot a few meteors! Unfortunately, a full-ish moon will make spotting them a little more difficult. Best viewing is between midnight and dawn. Good luck! 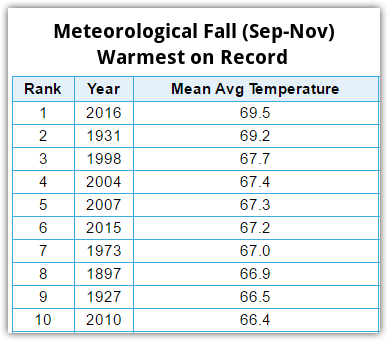 Very warm weather as compared to average continued throughout the fall as November's average temperature was eighth warmest on record. Following the warmest September and October on record, the three-month period of meteorological fall (September-November 2016) also ranks as the warmest on record. 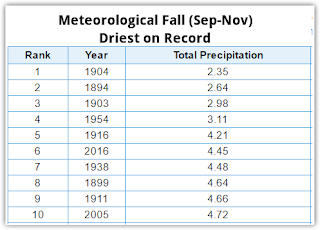 With precipitation well below average again in November, meteorological fall 2016 ended as the 6th driest on record, resulting in severe drought conditions in the Memphis metropolitan region this month. After several months with no severe weather, a storm system moved through on the 28th, however most damage reports actually preceded the storms as very strong southerly wind during the day peaked in the 50-55 mph range, resulting in power outages and scattered tree damage. The line itself also produced some wind and tree damage. 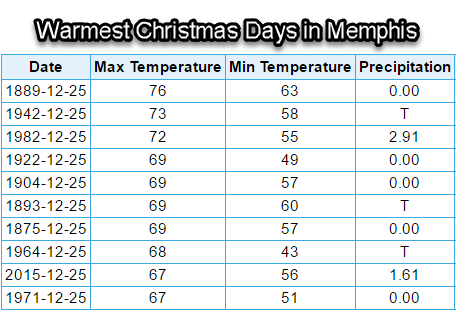 Comments: This month was the 8th warmest November on record in Memphis at 57.3 degrees. For the year, the average temperature is 67.7degrees, which is the warmest January-November period on record. 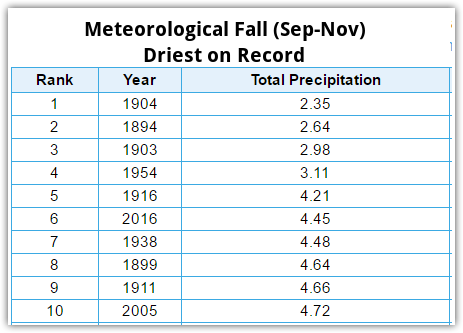 Comments: Despite a very dry month, through November, Memphis International Airport has recorded 54.26" of precipitation, or 6.32" above average (113% of normal). Dry weather for the past three-plus months, however, has resulted in drought conditions expanding and worsening to the "severe" category across the metro. In Friday's blog, the main topic was the wet weekend weather. 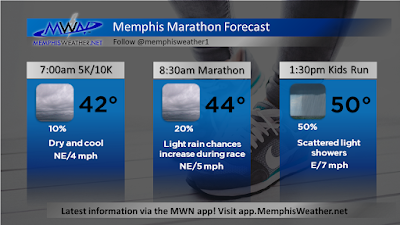 We got that, though it could've been much worse for the St. Jude Memphis Marathon, or even more likely, the Christmas parades later in the day. In fact, though several entrants and (by my eye test) hundreds of spectators skipped the Bartlett parade Saturday afternoon, it wasn't too bad with "heavy sprinkles" at times but no downpours. Most of the rain fell after dark. Today felt like mid-December with cool temperatures and low overcast hanging around, but very little rain. 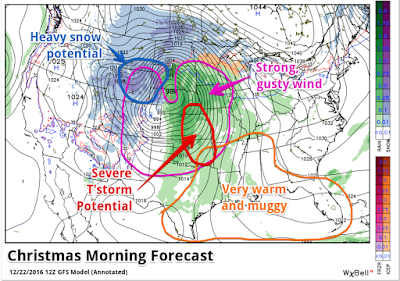 Another topic in Friday's blog was the upcoming active wether pattern this week. 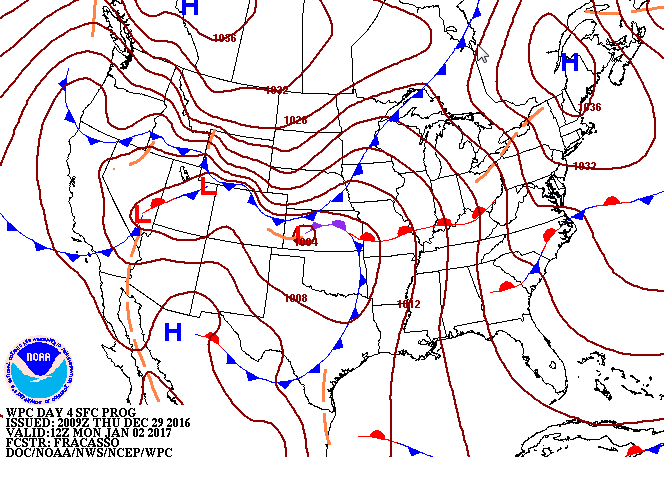 I'll provide a bit more detail on that tonight, starting with tomorrow's low pressure passage. Low pressure will develop along the western Gulf coast and begin to move northeast during the day, increasing our rain chances as it draws closer. Rain chances will ramp up from the south by early afternoon, becoming likely for the entire area by late afternoon and continuing overnight as the low will pass by just to our east. 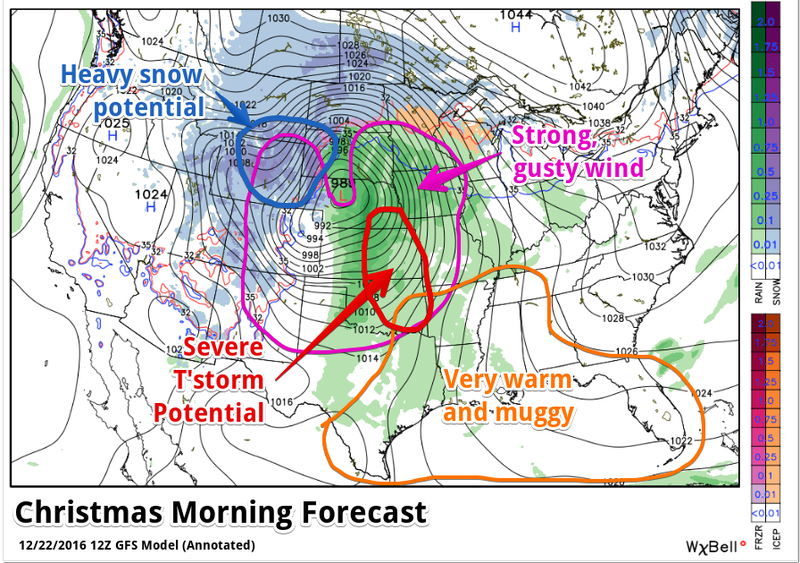 The map below shows the newest hi-res North American model (NAM) surface forecast at 3am Tuesday. 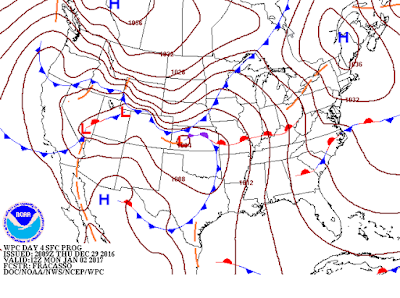 I've annotated the low (red L) cold fronts (blue lines) and a warm front (red line). With the low to our east, we won't get a good southerly wind and will avoid the "warm sector" of the system east of the low. 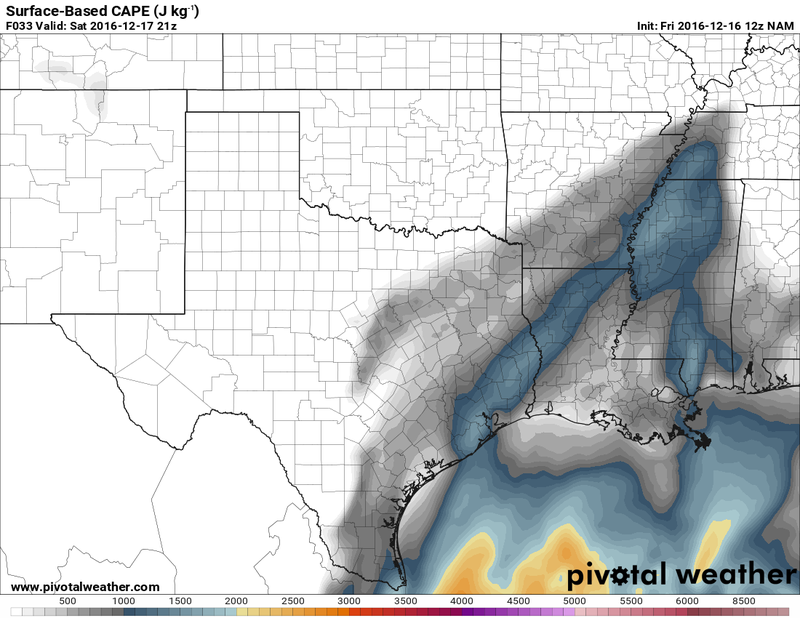 That means thunderstorm chances will remain fairly low, though a few are possible as the low approaches, and severe weather chances should remain well to our south, along the central Gulf coast. We'll get more rain to help our drought situation, but even the rain shouldn't be heavy for prolonged periods. 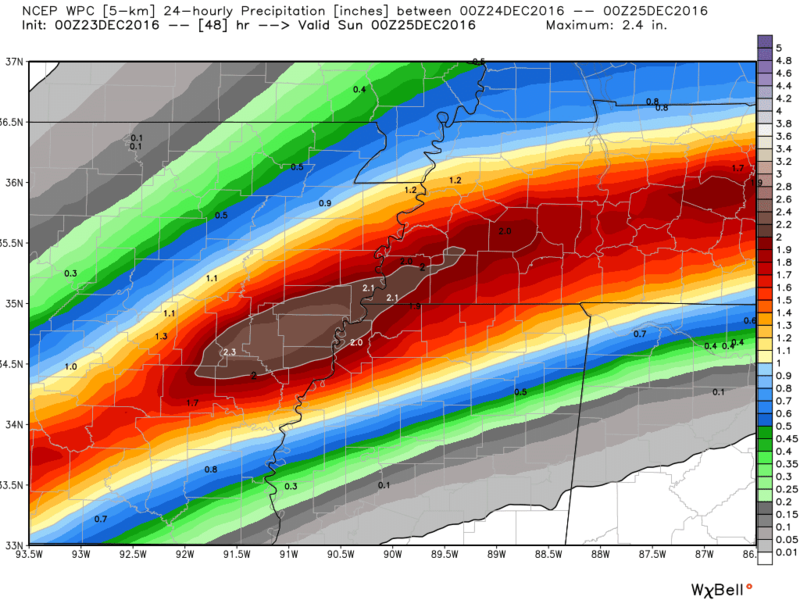 Most model data suggests we'll top out at no more than an inch. 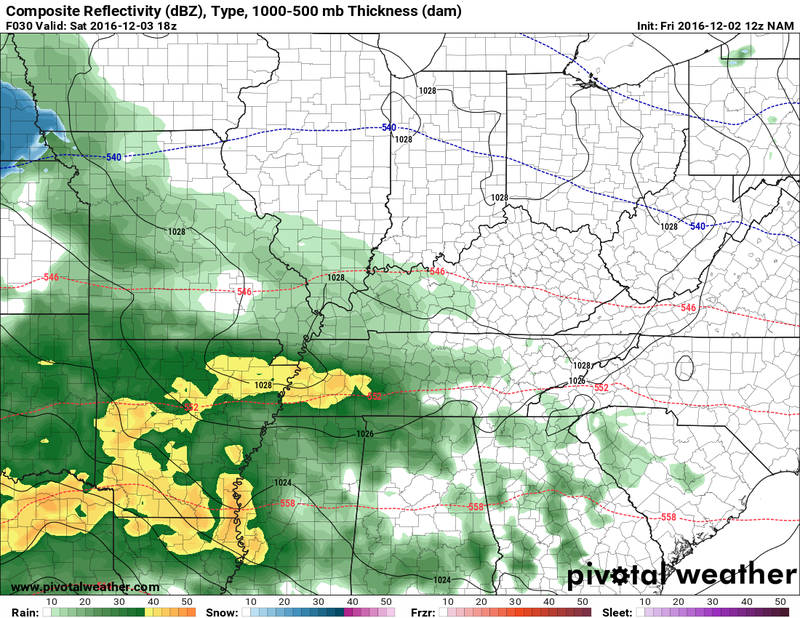 By the time you wake up Tuesday morning, the rain should be nearly done. Tuesday and Wednesday will be "tweener" days - between major weather systems with weak high pressure in control. Clouds are likely to stick around, though a few breaks could bring peeks of sunshine. Temperatures will generally be seasonal with lows in the 40s and highs in the 50s. 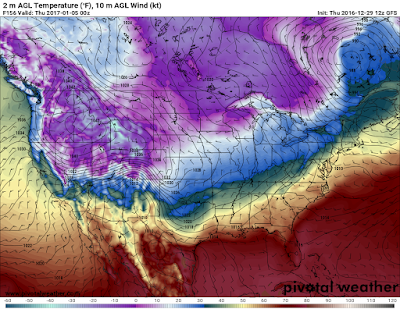 Wednesday night is when the "Big Kahuna" Arctic front arrives, as posted in Friday's blog. Scattered showers are expected with the front, but precipitation should be mostly an overnight event on Wednesday night. MUCH colder air, originating in Alaska, will dive southeast into the western U.S. Monday, cross the Rockies Tuesday, and surge across the central U.S. Wednesday, arriving in the Mid-South by Thursday morning. The coldest air of the season for the U.S. will arrive on gusty wind with temperatures falling towards freezing Thursday morning and remaining in the 30s all day with wind chills in the 20s. By Friday morning, lows will reach the lower 20s with wind chills in the teens and highs again only be in the 30s, or about 15-20° below normal. 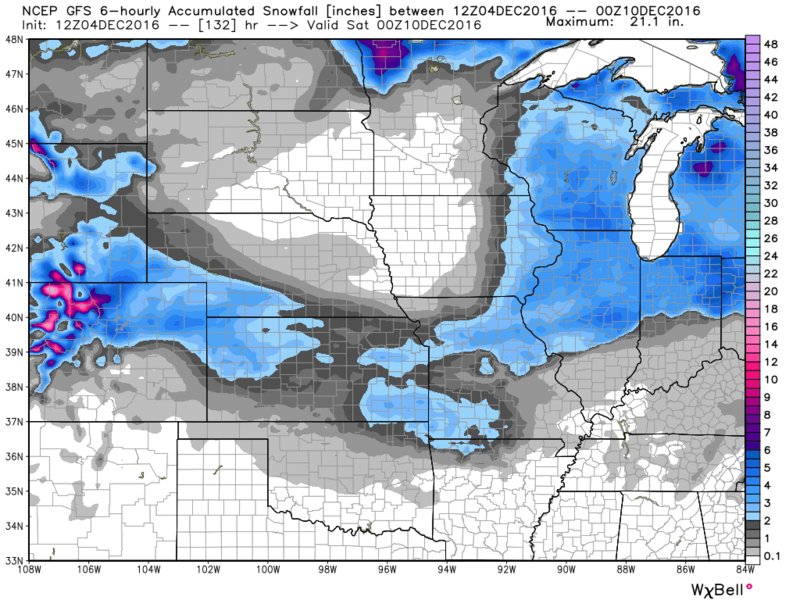 I've seen several references, including in national, model-driven "crap apps," a national weather network forecast, and even in local weather broadcasts, to the possibility of snow Thursday morning. Yes, it will be cold enough to snow at some point Thursday morning. But the two main players in the mid-range model world - the American and European model - differ on how quickly we get to "cold enough." 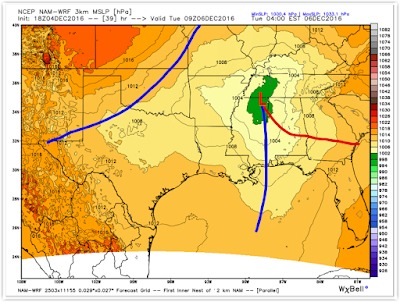 In my 20 years of experience forecasting Memphis weather, these types of systems (in which a strong cold front arrives from the northwest, dropping temperatures as moisture departs) are not prolific (or even marginal) snow producers. Almost always, sufficient moisture for precipitation is gone by the time the low level thermal (temperature) profiles are cold enough to support snow. If it's going to snow in these situations (at least in this part of the country), the most common scenario is to have the sudden burst of cold air produce snow flurries or a brief snow "shower" as the last of the moisture moves out. I can't rule this out early Thursday morning. I also am not including it in the forecast at this time. 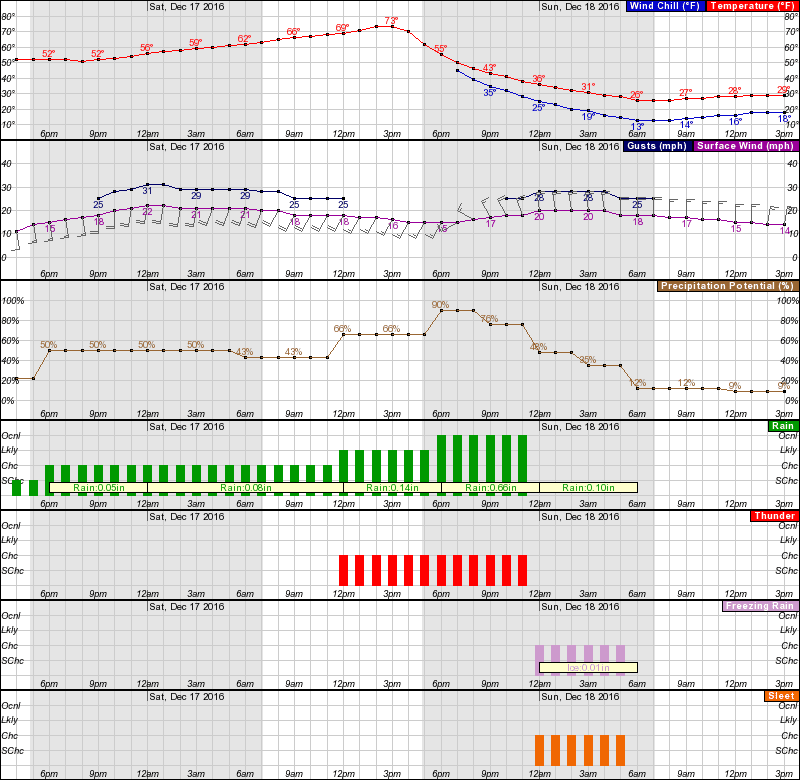 If I saw that possibility occurring, I likely wouldn't include it in the forecast until about 36 hours ahead of time. There's too much uncertainty in predicting the precise temperature profile to include it in this type of atmospheric setup unless it's a virtual lock. That won't happen until we're fairly close to the event in question. 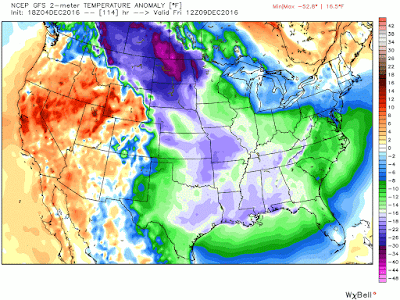 Below is a piece of evidence from the colder of the two models - the American GFS - to not include snow. It indicates the higher elevations of the Ozarks is the closest place to us that would get anything worth mentioning. As always, get the complete forecast, with regular updates made by an actual person, not a computer model, via our website or mobile apps. Links provided below. 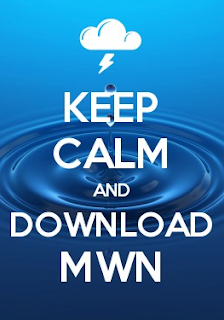 Pay the $0.99 for human-powered weather and avoid the hype and the crap! p.s. 2017 MWN wall calendars featuring pictures of Mid-South weather taken by local photographers (and myself), as well as Mid-South weather events and records throughout, are now available. These are made primarily for your enjoyment. We price them to break even. Check them out here. Lots of activities going on this weekend in the Memphis area, involving tens of thousands locally and, literally, from across the United States. It's St. Jude Marathon weekend and Christmas parade season! Unfortunately, Mother Nature is not going to be too cooperative as we see a round of precipitation move up from the southwest and envelope the area during the day Saturday, lasting into the first half of Sunday. This rain will be caused by moist air rising up into the area ahead of a low pressure system that moves along the Gulf coast. Note that the greens are very light rain with the yellows being steadier, but not particularly heavy, rain. We're not talking about a deluge and no thunder will occur either. However it does look like we could start to see sprinkles early Saturday morning with basically increasing rain chances as we go through the day Saturday. 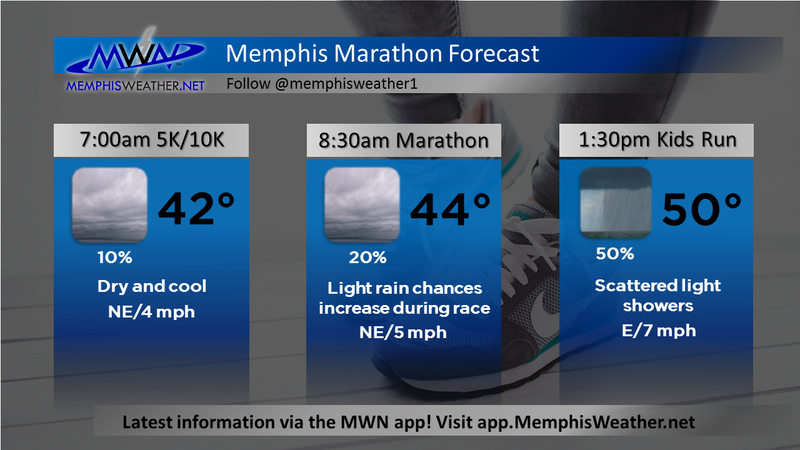 With any luck, most of the marathoners will be done before rain gets very steady and it will be just a nuisance. Here are a few key times pulled from the loop above. Note that these are not exactly what will be happening, but give us an idea of what to expect. As you can see, it's also going to be a chilly day with most of it spent in the 40s. Once rain gets going a little more steadily in the afternoon, it'll drop back down into the 40s after peaking near 50. 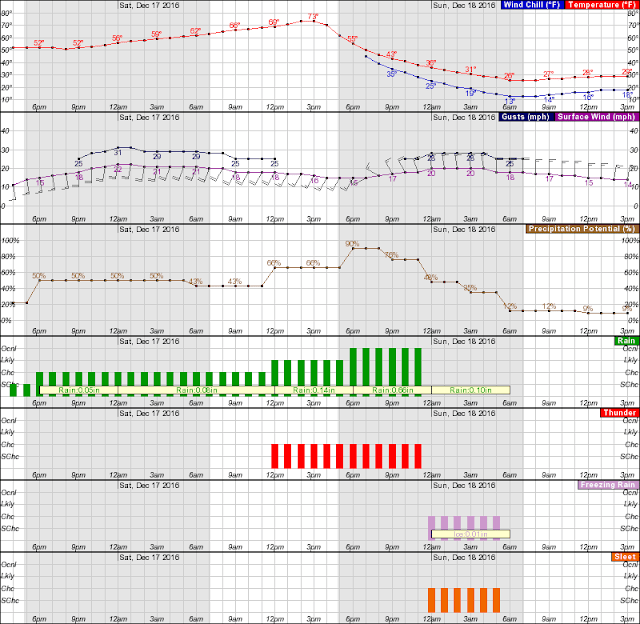 Fortunately, wind is not much of an issue, though there could be a bit more (maybe 10 mph) in the evening. For late afternoon/early evening parades, the news is not good unfortunately. 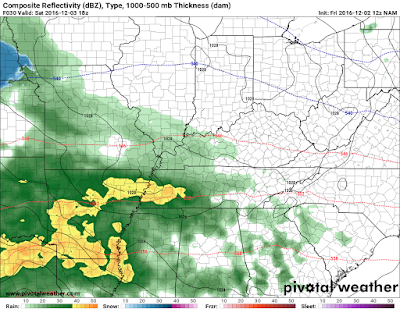 Steady light rain could possibly be moderate at times. 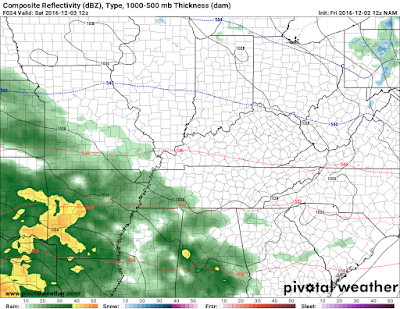 Rain chances by late afternoon are above 50%. 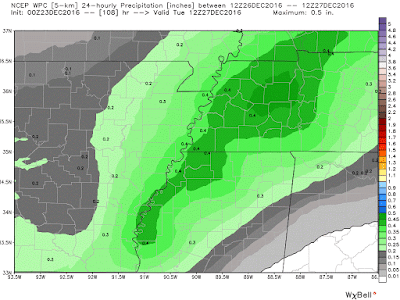 By Sunday when the rain moves out, rainfall totals will likely be in the 1/2"-1" range. 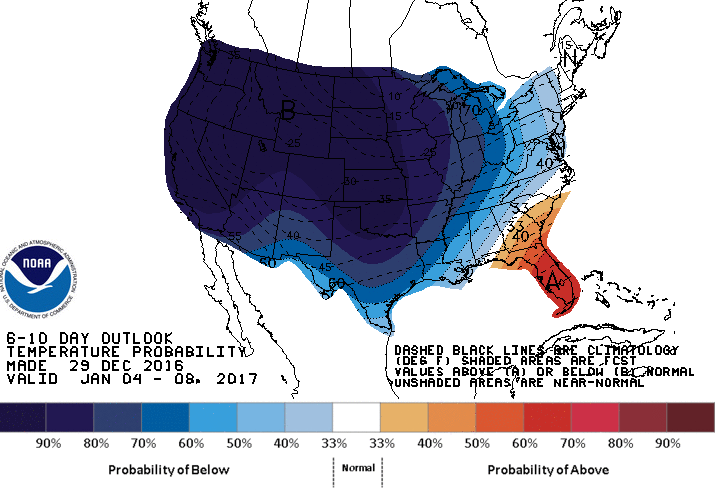 The pattern remains active the first half of next week. Another stronger, wetter system moves across the Mid-South Monday. Low pressure will move very close to Memphis Monday evening and a few thunderstorms are possible. Currently severe weather is not expected. Finally, after dry hours Tuesday and the first half of Wednesday, another front moves through Wednesday night. 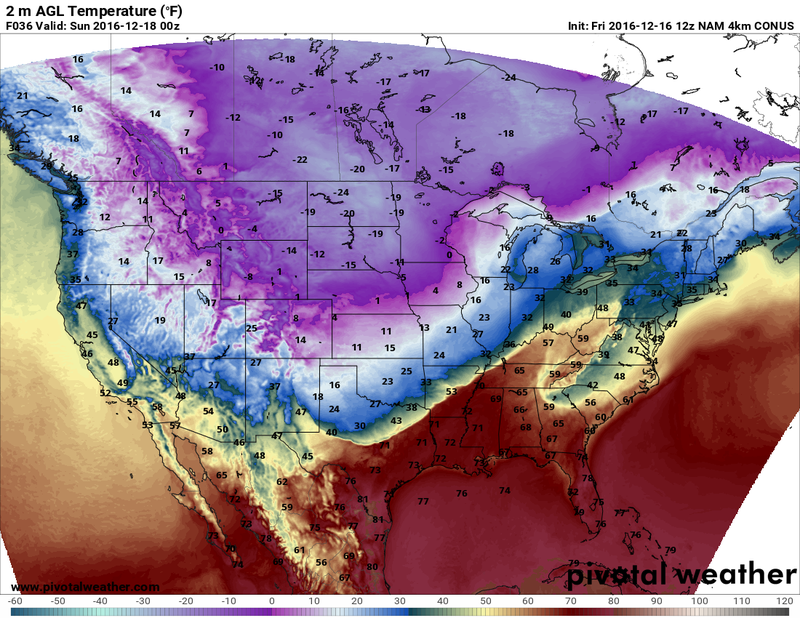 This is the "Big Kahuna" Arctic front you've probably been hearing about. More showers and a few thunderstorms will be possible with this front before temperatures nose dive heading into the end of next week. We'll have more details on both of these systems in the coming days, but be prepared for the likelihood of temperatures remaining in the THIRTIES (really!) most of the day Thursday and maybe Friday too! We'll all see a hard freeze Thursday and Friday nights.